Sometimes a bride and groom want to shy away from a run-of-the-mill wedding and add a theme to their event. 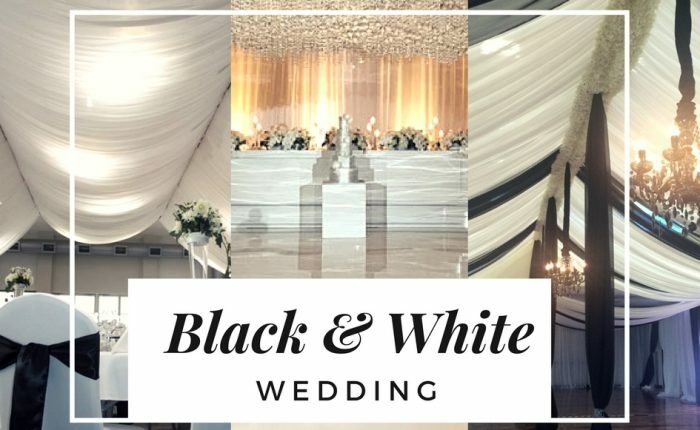 One of the most classic and elegant themes is the ‘black and white’ wedding. The bride will don the usual white gown – though she might have a black accessory like a sash or bracelet – while the groom dresses in a dapper black suit or tux. Bridesmaids will usually wear a dark, inky shade as well and the wedding decor will also correspond to this theme. And the bouquet you ask? That’ll be white too! One of the first things to think about is how to decorate your reception venue. If there are plain walls, why not begin your black and white decorations there? An event service partner can help you find the perfect luxurious drapery to help dress the walls, whether it’s in black or white or a contrast of the two. Why not add some black and white helium balloons to decorate the ceiling while you’re at it? You can also use wedding lighting to make your space more dramatic. You can cast dark shadows in some areas while illuminating others with bright, white light. It’s always a magical touch to add some fairy lights too and while these emit more of a warm, yellow light, who can resist their charm? Make sure you don’t forget about your wedding cake! There are a huge number of ways in which you can customise this to be black and white. Add a striped pattern, black icing embellishments or a simple black decoration on top. From the cake table to your guests’ seats the experience can be a black and white one, too. White plates and tablecloths can be contrasted beautifully by black napkins, place holders and menus. Everything down to the very chairs you and your guests sit on can be customised to fit the theme. Remember to use your imagination – the black and white colour theme can be applied to almost anything. Take your inspiration from things like chess boards, Audrey Hepburn, black lace, embroidery and pearls and you can’t go wrong. It doesn’t get much more chic than this. At Pro Light & Sound we are experts in helping to style the perfect black and white wedding affair. We can help you set the perfect scene, get the draping, the lighting, the styling just right so that your special day will be an affair to remember.